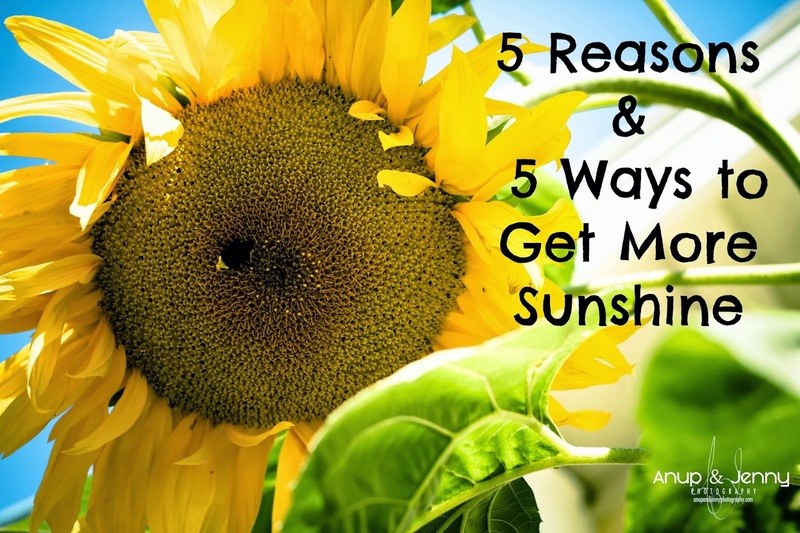 5 Reasons & 5 Ways to Get More Sunshine - Heal Thyself! Ahhh, winter. Such a wonderful for time for reflection. But the daylight hours are short and sometimes quite dreary. I know that sometimes in winter, my reflections become not so self-empowering. Helping yourself to overcome these winter blues is by getting more Vitamin D. Vitamin D is best absorbed from the outside sunshine. But come winter months, especially in the Northern most climates, it can be quite rare. So let's do ourselves a favor and make sure we get enough SUNSHINE! UVB rays from the sun are the only rays that help you make Vitamin D. And they aren't passed through windows! Therefore only the harmful UVA rays are! A natural mood elevator! Getting outside and soaking up the sun, whether on a beach for the afternoon or for 10 minutes midday, fosters positive feelings of one's self. Sitting in a dark home or office creates negative energy in your body, which in turn inhibits proper functioning. Some studies suggest that correct sun exposure can lead to a decrease in blood pressure by the release of nitric oxide, which can lower your risk of heart disease and stroke. Some theories suggest that breast cancer is related to a Vitamin D deficiency. Therefore, they suggest correct levels of Vitamin D could help prevent breast cancer! Now that we know sunshine is so, SO important, here's my list of ways to make sure you GET OUTSIDE. Get an animal. Preferably one that likes to be outside. A small dog will work just fine for walks. But consider other animals, like chickens. Even in some cities, backyard chickens are OK. You'll have to get outside to take care of them and they'll also add some backyard entertainment! If owning a pet isn't possible, consider volunteering at an animal shelter. Shelters are always excepting volunteers to walk dogs. Gently caring for an animal is a surefire way to bring a smile to your face too! If you work in an office and don't get home til o'dark thirty, try taking a walk on your lunch break and bringing your sandwich along. You'll be outside during the best part of the day. Make sure you get out in the sun at the correct time of day. The optimum time is at solar noon (varies in different latitudes) when the sun's rays are the strongest. Sitting in front of a window is not a good way to absorb sunshine. The window actually blocks the good rays (UVB) and lets in only the bad rays (UVA). Please consider those that you know who are home or wheelchair bound and help them to get outside by offering to help. Do you have any tips for getting outside more? I'd love to hear them!